"If we're gunna survive, people are gunna die." 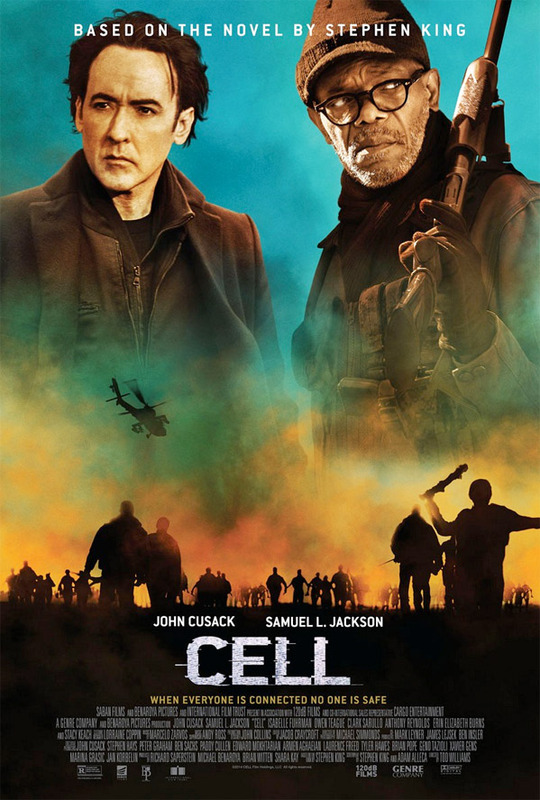 Saban Films has released an official trailer for a film called Cell, starring John Cusack and Samuel L. Jackson. This is an adaptation of the best-selling Stephen King novel of the same name, about an electronic signal sent to people's cell phones that turns them into "rabid killers". Another angry zombie movie, but this time it's our cell phones that have turned everyone into zombies, how apt. Despite the fact this is a Stephen King movie starring Cusack & Jackson, it doesn't actually look that good. Maybe I'm just tired of the everyone-turns-into-a-zombie movies. What about you? When a strange signal pulsates through all cell phone networks worldwide, it starts a murderous epidemic of epic proportions when users become bloodthirsty creatures, and a group of people in New England are among the survivors to deal with the ensuing chaos after. Cell is directed by filmmaker Tod Williams, of the films Paranormal Activity 2, The Door in the Floor and The Adventures of Sebastian Cole previously. The screenplay is written by Stephen King and Adam Alleca, adapted from Stephen King's novel of the same name. Saban Films will release Cell in theaters on July 8th, with an early VOD release starting June 20th. I know it's based off of a Stephen King boo, but the concept just sounds odd to me. I would compare this more to The Crazies rather then another zombie film, but I guess you can kind of say The Crazies is just that. Either way, it doesn't look too bad and I'm sure I will eventually check it out. The book was great. Hope the movie does its justice. Reminds me of "The Happening" or "Pulse." Saturday afternoon movie. What like Valentine's plan in The Kingsman? This looks ridiculous but America will lap it up. Guns, zombies, guns, Jesus talk, shooting guns, family man trying to get home, hitting people with guns, more zombies, people shooting guns backwards.... you get my drift. SPOILER ALERT (maybe) Not SK's best book, but it was an interesting read. It's been a while, but I believe the protagonist was actually one of those guys who refused to have a cell phone. It came out a decade ago or more, so back then, that would have been plausible. If done right, this will be more than just another zombie movie. At first, the infected people were mindless, going crazy and killing anyone, even each other. At night, they would all shut down and receive signals from ??? It gave a good opportunity for those unaffected to kill as many as they could, as showcased in the trailer by the football field full of flaming bodies. As the story progresses, the "zombies" upgrade; become more intelligent. I'm not sure how closely the movie will follow the book, but I think it may be worth watching. Not excited enough to see it in the theatre. I really like John Cusack and was fully on board until zombies showed up in what amounts to another The Walking Dead movie. I'm sure it will do well. Ugh. Really, is Hollywood out of good scripts. What did this get funded?